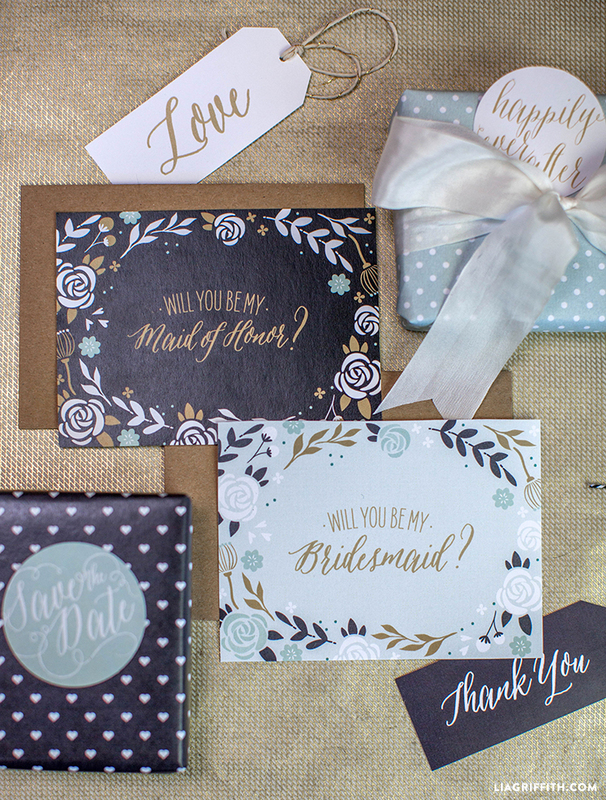 We are seeing lots of gorgeous wedding inspiration at the moment and have been designing our own range of love inspired paper goods for your special day. 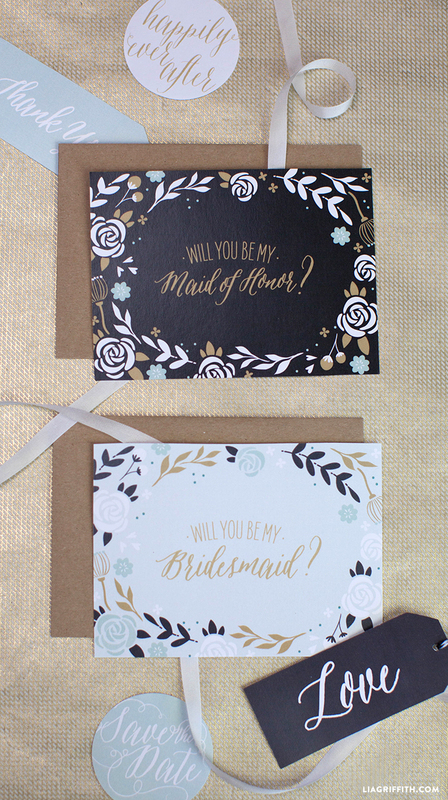 These “Will You Be My Bridesmaid?” cards are the perfect little note cards with which to ask that oh-so-important question to your girlfriend or sister. We are sharing two different designs. The first, a rich combination of a black background with white, gold and mint green floral edges is a modern twist on a classic palette. It simply reads “Will You Be My Maid of Honor?” and is blank on the back from you to write something personal should you wish. The second has a soft, mint green background with that same pretty floral design in black, white, mint green and gold. It reads “Will You Be My Bridesmaid?” and is also blank on the back for your own message. To download your note cards simply click on the button below, open the PDF and print onto card stock or a good quality paper. Trim to size and pop into a 5″x3.5″ envelope and you are good to go! I’m loving the color scheme and the unique designs! 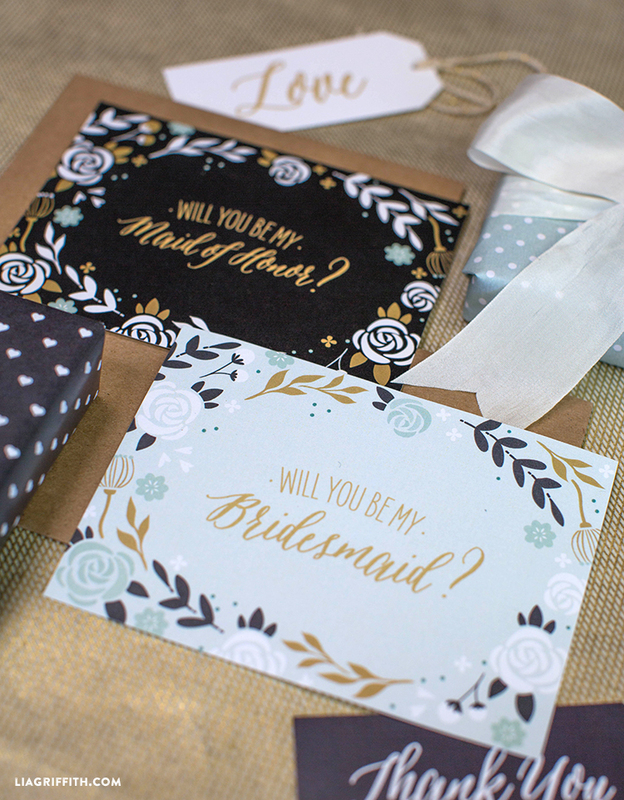 It’s so fun to ask your maids and MOH in a stylish way. Thanks for sharing! Unfortunately there’s no link to download or shop. Sorry, we have been having some problems with this lately. All fixed now! Thank you. For these pretty cards and for the link. Although I don’t require Bridesmaid or Best Man (I’m married for 33 years and hope this will last for many more years), some of the younger generation of my family are not yet married. If they do, these cards will be useful. I am trying to download the pdf for the maid of honour/bridesmaid cards, but can’t find the download button. Sorry, we have had some problems with this lately. I have double checked and it is there now. Enjoy!